About 20 national and International artists will be onstage next weekend offering a series of free shows over four days. The 3rd Puerto de Chacala Music Festival is ready to go from March 10-13, 2016. This is the top cultural and artistic event hosted by this Picturesque Village in the Riviera Nayarit. 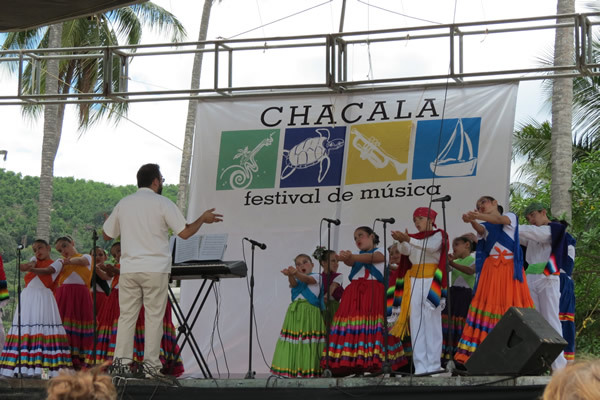 National and international artists will be on stage in Chacala offering free shows to the general public. Music groups, dancers, solo artists, visual artists and much more will all be part of the celebration. There will be three concerts held in El Palmar/Palmgrove starting at 6 p.m. and another one in the morning for children. The first concert will feature Jazz on Thursday at 10 with Olivia De La Cruz, Café Canela, Dan III and the Trio Moruno. International Night takes place the next day with Janalyn Rose, Ojo de Agua, Luna Rumba and DJ B3HAR. On Friday, March 12th it’s Mexican Night with Kindermusik, Chacoro, Mariachi Infantil, Grupo de Danza Infantil Nayarit, Mariachi Tradicional Cora and Musical Sereno Purpura. Then on Sunday, March 13th, the celebration continues with a children’s concert. At 10 a.m. “Calcetín” the Clown will be onstage, followed by the Percussion Workshop Kids, Patito Feo and Cuenta Cuentos. Afterwards, Winston Colonel will be onstage at the plaza at 6 p.m.